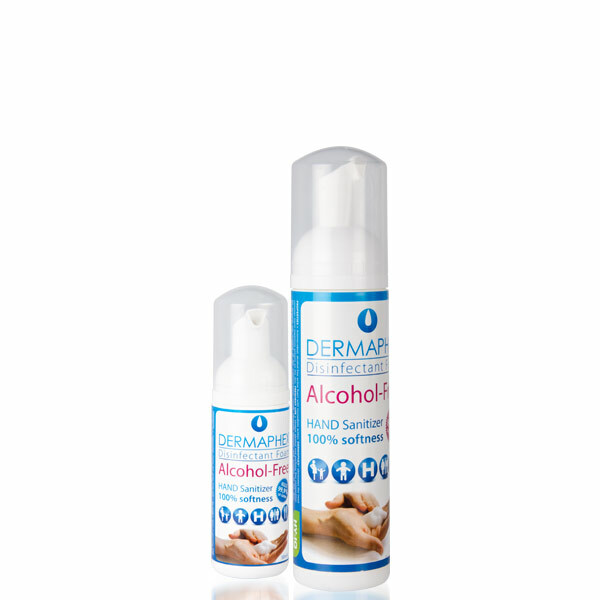 Dermaphex® is an antimicrobial active foam alcohol-free, fragrance-free and paraben-free wich eliminating 99.9% of most common germs present on the skin. Composed of only 3 ingredients: ionized water, benzalkonium chloride and carbamide, coupled with technological innovation called HY-iQ (Hyper Ioniq Quotient), the Dermaphex® foam disinfects the skin without causing allergy, dryness or irritation of the skin. With its foam texture with a viscosity similar to water, Dermaphex® covers a larger skin area than gel for the same amount of product and allows you to use 2 to 3 times less of product for the same efficiency. The absence of ingredients like alcohol, parabens, fragrance, phenoxyethanol, triclosan and others, usually present in hand-sanitizers such as alcohol-based gels for example, allows to Dermaphex® disinfect all skin types, even the most sensitive and with softness. 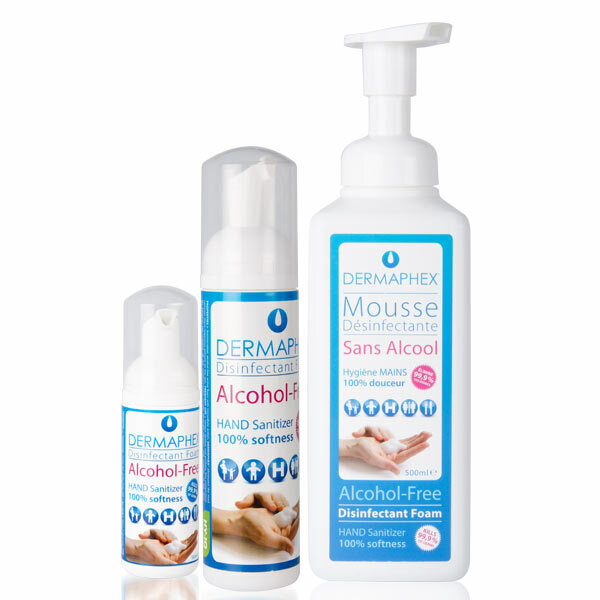 All these properties make Dermaphex® the first hand-sanitizer suitable for the whole family and meet the main European standards for biocides (EN 1040, EN14476 + A1). Dermaphex® how he manages to kill them? It is a quaternary ammonium well known in the pharmaceutical industry and already used in disinfection solutions through its biocidal capacity. Very powerful, it is always diluted in cases where it is part of the composition. It is for this reason that Dermaphex® contains only 0.12%. So it is an effective solution active against bacteria, fungi and enveloped viruses because it easily penetrates the cell membrane of microorganisms, rendering them inactive and thus blocking their reproduction and therefore proliferation. As we have seen, the naked viruses are more resistant and more difficult to fight. This is why a second ingredient comes in: ionized water. To overcome this little inefficiency, we had to find a solution for increasing the power disinfectant of the benzalkonium chloride without increasing its concentration. 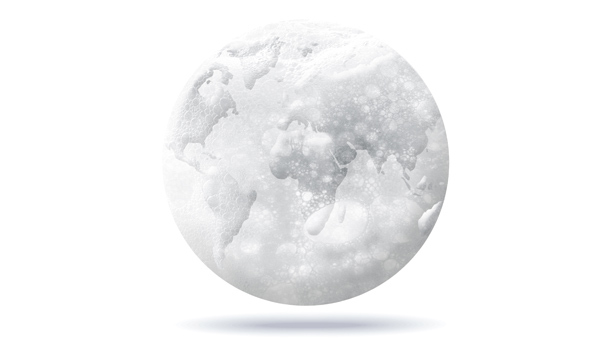 thanks to the HY-IQ technology, Dermaphex therefore enjoys an efficiency up to naked viruses. The proof is the results of tests on the Rotavirus which, remember, is the naked virus responsible for the majority of gastroenteritis. In addition to ionized water that naturally has a moisturizing role, a third ingredient reinforces this effect : the carbamide. As Aloe Vera, the carbamide is commonly used in cosmetics for its moisturizing properties. It allows not dry the skin as do alcohol based products such as hydro-alcohol gels. 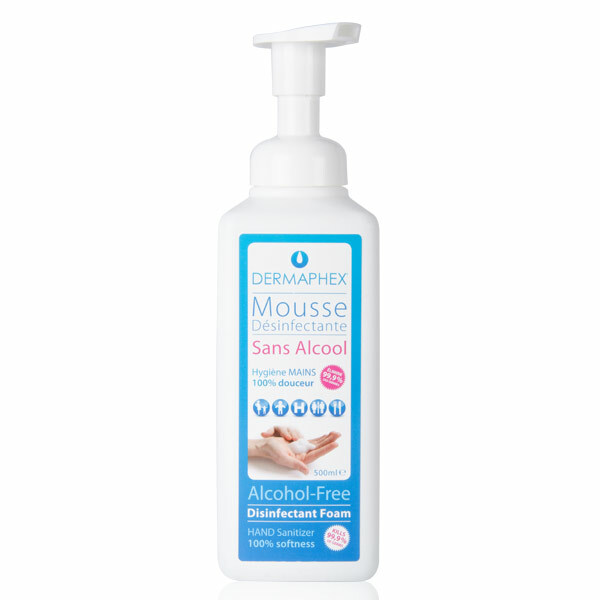 Dermaphex® is the first hands-sanitizer without alcohol, paraben and fragrance eliminating 99.9% of most common germs on the skin. These are microscopic unicellular organisms. The human body has more bacterial cells than human cells. However, as everywhere, there is the nice ones and nasty called pathogens. It is they that cause infectious diseases. Bacteria can assume basic functions like reproduce themselves, transmit genetic information, but also tap their resources of matter and extract energy of the environment. They have a certain autonomy and a metabolism of their own. Once they enter the body, the bacteria cling to human cells or enter inside, to dramatically increase their initial capacity of reproduction and thus make us sick. While there are antibiotics to fight them, the best defense remains the attack. That is why the rules of hygiene such as hand washing or, in the absence of no water, use a hands-sanitizer are the simplest preventative solutions to prevent contamination. Viruses, unlike bacteria, need to introduced into a cell to grow and reproduce. Their transmission may be airborne or even indirect contact. That is to say that if a person with a virus touches an object and that in your turn you or your child, touch it, then there is risk of contamination. There are several types of viruses, those which have a membrane called wrapped (eg. influenza virus), and those who do not have one, called naked (ex. : rotavirus, responsible for the majority of gastroenteritis). Contrary to what one might think the naked viruses are more resistant than enveloped viruses. These, sensitive to heat, acidity or to lipid solvents, lose their infectivity when their membrane is destroyed. Fungi are microorganisms generally multicellular, which are spread by direct or indirect contact. They prefer warm, moist and dark places for their development. Once in the body, they extract organic compounds and transform the material in order to grow and spread by spreading spores. In case of contamination, it is advisable to see a doctor or dermatologist to get a prescription antifungal. 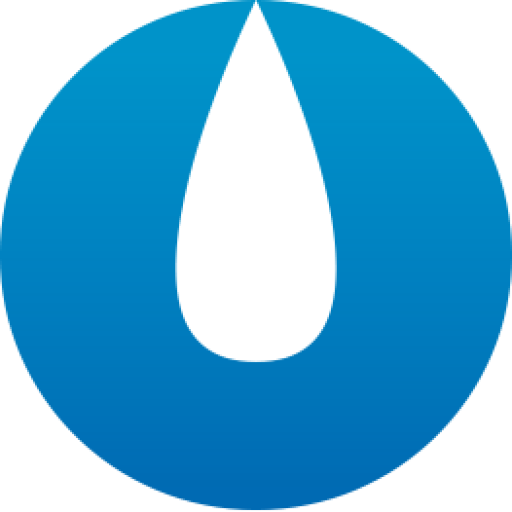 But good ways to protect themselves from contamination remain the daily hygiene like well dry the feet after showering or washing hands regularly or, in the absence of water points, use a hands-sanitizer.